Did the FIFA World Cup capture your imagination? Even if you're not a soccer fan, the fact that the U.S. Men's Team made it out of the "Group of Death" surprised and excited Americans everywhere. Moreover, for the first time in history, the U.S. Men's Team advanced to the knockout round in two consecutive FIFA World Cups. As a dad who has watched two daughters play club and school soccer for more than a decade, I've developed a passion for the game. (I now play indoor soccer on a team with my oldest daughter--not very well, I might add, but it's a ton of fun.) I watch soccer now more than any other sport. As a result, I've become familiar with two of the game's stars both of who were on display at the Word Cup -- Lionel Messi of Argentina and Cristiano Ronaldo of Portugal. Messi and Ronaldo are considered by almost every fan and soccer pundit to be the two best players in the game and two of the best of all time. Together, they've won the past six Ballon d'Or awards as the best player in the game. Messi has won it four times to Ronaldo's two with the non-winner in each year being the runner-up in five of the six years. So it's clear that among the soccer intelligentsia who bestow the Ballon d'Or that Messi and Ronaldo are the "it" men of the game. Even the casual soccer or sports fan -- even someone who has rarely, if ever, watched a soccer match -- when asked to name the best player in the game will undoubtedly mention one, if not both. But who is better, really? Before I answer that question, answer the following one quickly -- as soon as you hear it -- and write down your answer. Who do you think is the better player? We'll come back to your answer later. The answer to who is better depends on whom you ask. It can be influenced by a host of factors that include allegiance to country or club (Messi plays for Barcelona and Rolando for Real Madrid, two of the world's elite teams), how often you've watched each play matches, knowledge of and experience playing the game and exposure to the opinions of fans and experts. The fact is it's not easy to separate these two superstars unless you're willing to examine the evidence and not allow extraneous factors to influence your opinion. And therein lies the lesson for how you can become a better parent. Nate Silver, creator of the website fivethirtyeight.com and author of the best-selling book The Signal and the Noise, is famous for using statistical analyses to separate the chaff from the wheat. To answer the question of which player is better, he compared Messi and other soccer stars by conducting rigorous analyses of the most important statistics focused on player performance. and how their defensive playmaking compares to other high-volume shooters. He also separated the players' from the effects of playing on their teams (i.e. the influence of how good their teams and teammates are on the players' performance). And this is only a sampling of the data Silver crunched. After examining the evidence, Silver came to the crystal-clear conclusion that "Lionel Messi is Impossible." (Read about his analyses in this article on his website). The results of his analyses are so overwhelming in favor of Messi as the best player in the world that even Ronaldo can't compare. (In effect, these analyses offer an examination of the two because Ronaldo came in second -- a distant second -- in many categories.) So if someone tries to argue with you that Rolando or anyone else is better than Messi, you can use this ream of facts to show how misguided they are. 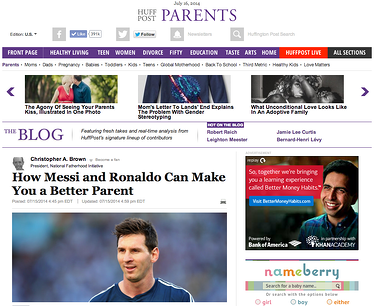 Just as these analyses provide evidence that Messi is far and away the best soccer player in the world, so too is there evidence on how to be an effective parent. Unfortunately, some parents don't care enough to examine the evidence or don't know it exists, to their own detriment and that of their children. I am convinced, however, that parents must and can do better at examining evidence about what leads to effective parenting -- if they would only make the effort. They must also teach their children to examine evidence generally so that their children grow into adults who make informed decisions and are skeptical about acting on information (e.g. opinions) in the absence of evidence or that is based on flawed or "cherry-picked" evidence. I've read several books lately on how people tend to not rely on sound evidence to inform their beliefs and, ultimately, decisions. (In addition to Silver's book, I highly recommend Daniel Kahneman's Thinking, Fast and Slow.) Humans have a tendency to use heuristics, or "mental shortcuts," to make decisions. Why? Because it's easier to rely on a shortcut than to do the hard work necessary to examine the evidence before making a decision. (Yes, thinking is hard work.) The problem is these shortcuts create biases in thinking that cause us to make decisions -- including those about how to parent -- that have little or no basis in fact. When I asked you which player you thought was better, what was your initial answer? Unless you said you didn't know (perhaps because you don't follow soccer), you probably had a very confident opinion. What I didn't ask was why you had that opinion. You might be surprised to learn that you quickly -- automatically -- drew on whatever you had ever heard about these two players. You probably relied on the most recent exposure to information about them. If you watched the FIFA World Cup, you might have been influenced by a discussion among the experts about Messi's greatness, that he won the Golden Ball (the award for the outstanding player in the tournament) and that Ronaldo and his Portuguese team performed poorly. (The incredible cross Ronaldo made that led to the tying goal in the final minute of stoppage play against the U.S. not withstanding.) Regardless, the fact is you answered quickly (perhaps after a little thought) based on what was most readily available in your memory. One of the mental shortcuts parents rely on is called the availability bias. (There are many others that affect parents' decision-making, so this one is illustrative.) Simply put, parents rely on what immediately comes to mind (what's available in their memory) when making decisions about how to parent (e.g. discipline their children). What readily come to mind are how they were parented, how the other parent in the family parents and how other family members (e.g. siblings) and friends parent. Other factors that might influence availability include stories of parenting (good and bad ones) that a parent might have seen on television or in a movie. Or perhaps they just read a parenting book chocked full of opinions about how to be a good parent but that's void of evidence. Parents succumb to this bias because it requires little effort. It's just easier to make a decision quickly and easily without examining the evidence. Unfortunately, this and other biases can lead to poor parenting. That's why I encourage you to seek out parenting advice that is evidence-based and evidence-informed. I also encourage you to question where the advice you hear comes from and to tell your children to do likewise regardless of topic. If you do both of these things, you will increase the chance that you'll be as effective a parent as you can be and that your children will reach their goals in life as often as Messi finds the back of the net. What informs your decision-making when it comes to parenting?